The Target Saver: Target: Zone Perfect Bars- ONLY $0.37! Target: Zone Perfect Bars- ONLY $0.37! You may want to add this deal to your Target list this week. 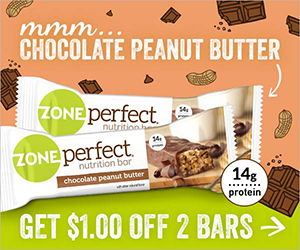 Using this new high value $1 off any two Zone Perfect Single Bars you can can get two Zone Perfect bars for only $0.37 each! Makes it $0.73 for two or $0.37 each!